A hex bag is a charm composed of a mixture of herbs, talismans, and other supernatural ingredients, placed in a piece of cloth and bound with leather. It is used to bring about a specific effect – usually, but not always, malicious. A hex bag intended to harm someone also contains a personal belonging of the intended victim (usually clothing). Apparently the only ways to stop a hex bag are to find and burn it, have the witch casting the spell break it, or cast a powerful counter-spell. When a hex bag is burned, the flames become a bright blue. 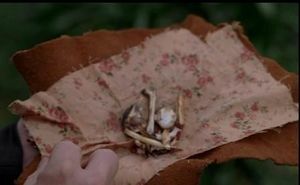 In thetie-in book Supernatural: Bobby Singer's Guide to Hunting, it is stated that the hex bags used to shield against demons and angels contain two bones from a chicken's foot, an unbroken spider egg, equal quantities of lavender and hemp, and goofer dust. The contents of the hex bag used in the spell to kill Amanda Burns in 3.09 Malleus Maleficarum. Hex bags are made by a witch, Amanda Burns, and a demon, Tammi, in order to kill people. These hex bags contained rabbit's teeth and bird bones. One hex bag is intended to kill Dean. Sam is unable to find it, but Ruby arrives with a potion that saves Dean. Ruby tosses Sam and Dean hex bags designed to protect them from Lilith for a time. Hex bags are used to kill several ritual sacrifices. The bag is made from a Samhain talisman, gold thread (an extinct plant), and the charred metacarpal bone of a newborn baby. One of the hex bags is placed in the wall of Sam and Dean's hotel room. It is found by Castiel and Uriel, who appear to have neutralized it by the time Sam and Dean arrive. After the ritual requiring the sacrifices is completed, Samhain is raised, breaking one of the 66 Seals. Ruby makes a hex bag that shields Sam, Dean, Anna, and herself from demons, specifically Alastair, and angels. Ruby later burns one of them to reveal herself to Alastair and make a deal with him as part of a trap devised by Sam. Dean and Sam have multiple hex bags to keep Lilith from finding them, but Sam burns them in order to have the opportunity to confront Lilith. Sam makes hex bags to keep the demons from finding them. When Dean asks where Sam got them, he reveals that Ruby taught him how to make them. Later in the episode, Castiel reveals the hex bags cannot prevent Lucifer from finding them. He marks Sam and Dean with Enochian sigils to hide them from angels. Crowley reveals that he used a magical coin hidden in the Impala to track and eavesdrop on Sam and Dean. The coin worked in spite of their hex bags. 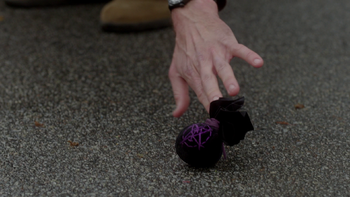 Sam and Dean plan to make a hex bag to protect Ellie from being detected by Crowley so she can dodge her deal. It is safe to assume that Crowley used a hex bag to kill Tommy Collins, first making him believe a wendigo is outside his door, than causing his head to explode. Crowley putting a hex on Jody Mills. When Crowley threatens to kill Sarah Blake, Dean and Sam arrive to protect her. While Dean demon proofs the place, Sam catches up with Sarah and finds out that she is married and has a daughter. Crowley calls a few seconds before the deadline and starts to count down to Sarah's planned death, which prompts the boys and Sarah to arm themselves and wait for Crowley to appear. After Crowley finishes counting, Sarah suddenly collapses and starts to choke to death. Sam, realizing that Crowley is using a spell that involves a hex bag, starts to hurriedly search for it but to no avail. Sarah then dies and Dean in anger chucks the phone against a wall; it breaks apart, revealing that the hex bag was in the phone all along. Crowley continues his plan of killing the people that Sam and Dean have saved over the years, this time posing as a man named Roderick on a blind date with Jody Mills. When Jody excuses herself to the bathroom, she finds a hex bag in her purse and thinks nothing of it, but soon begins vomiting blood. Crowley gets a phone call from the Winchesters, wanting to make a deal, just in time to save Jody's life. When investigating the death of Max Alexander, Sam tells Dean that everything about the death seems "very witch-y." However he also tells him he was unable to find a hex bag, bringing them back to the drawing board. Rowena, a natural-born witch, uses hex bags to perform various spells, including Defigere et Depurgare, a spell she invented herself which liquefies a demon's smoke and kills the demon. Rowena uses a hex bag to induce a nightmarish vision in Crowley. Hansel wears a hex bag around his neck given to him by Katja which, when squeezed, triggers a transfiguration spell that transforms adults into teenagers and transports them into Katja's cellar. 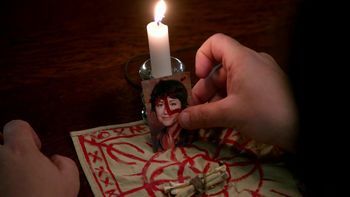 Dean later reverses the spell upon himself by stealing and squeezing the hex bag, but it is destroyed when he shoves the hex bag in Katja's mouth to prevent her from casting a spell and then shoves her into her own oven, so he can't revert Tina back to normal. Sam uses the Defigere et Depurgare spell from Rowena to kill Crowley, placing a hex bag in his jacket pocket after trapping him with a devil's trap bullet. Crowley reaches into his pocket and retrieves a hex bag and tosses it on the table, revealing that he was aware Rowena planted it as she patted Crowley's jacket earlier.